The circumstances surrounding Osama bin Laden’s reported death raise urgent questions over how the US is so sure it got its man. Reports suggest Saudi Arabia refused to take Bin Laden’s body. US personnel have so far said they identified him by facial recognition, but have declined to say whether they used DNA analysis. Reports have also suggested that Saudi Arabia was asked to take Bin Laden’s body – but refused to do so. The fact his body was buried at sea has so far only added to the speculation, although as a Muslim, he had to be laid to rest as quickly as possible. Under Islamic law, people can only be buried at sea if they died there, or if there is a risk their body will be exhumed or dug up if buried in the ground. The release of a photograph purporting to show Bin Laden’s corpse – which was later confirmed to be a fake – added to the confusion. Journalists have not yet had the opportunity to ask more than a few questions of the Obama administration about details of Bin Laden’s death. A former British ambassador to the US, Christopher Meyer, told Sky News: “I imagine we will see proof. “I can’t concede the US president would go out to make a statement to the world that Bin Laden is dead without being able to produce evidence that he is dead. The announcement is not the first time the world has heard of Bin Laden’s death. Claims that the US and Britain kept up a pretence he was alive in order to continue their war on terror have been dismissed as conspiracy theories. It has been suggested that Bin Laden died nearly 10 years ago during the battle for Tora Bora in Afghanistan, either from a US bomb or from kidney disease. And as for his audio and video statements, their authenticity has continually been questioned. One of his video statements, released just days before the October 2004 US presidential election, was said to have been crucial in helping George Bush secure a second term in office. But his statement from December 2001, when he was seen to confess to the 9/11 attacks, has attracted the most attention. Bin Laden had insisted numerous times, through the Arab press and in video statements, that he had no involvement with the atrocities. His sudden confession was picked up on by doubters. Additionally, his appearance in the December 2001 video was markedly different. He sported a black beard, not his usual grey one, his pale skin had become darker and he had a different shaped nose. He also looked in good health – a contrast to his earlier gaunt appearance – and critics have pointed to the fact he is seen writing a note with his right hand, although he was left-handed. In total, Bin Laden is thought to have released around 40 statements since 9/11, many of them with clear references to events at that time. When Uday and Qusay Hussein – the sons of Iraqi dictator Saddam Hussein – were killed in a firefight with US troops, authorities relied on photographs of their bodies to convince people they were dead. And when Saddam himself was executed, video footage of his death and subsequent photographs seemed to give final proof of his death. And how innocent american people are that they believed this shocking news without any proof LOL. “Bread, cloth and house”. These were the famous words of the first Prime Minister of the Pakistan Peoples Party, the largest Democratic Party in Pakistan. Zulfiqar Ali Bhutto once made a promise; today it seems it was just a joke. Through no fault of his own and a few decades on ministers and followers (Jiala’s) of the Pakistan Peoples Party will talk about everything else but the promise. No longer is the Pakistan Peoples Party a Bhutto legacy, but the name just continues to haunt the people of Pakistan. One may wonder, Zulfiqar Ali Bhutto has been dead for many years, and his beloved daughter Benazir Bhutto is also no longer with us, for that matter his sons, Shahnawaz or Murtaza are also departed souls. Why then does the Pakistan Peoples Party continue to use the name Bhutto for the betterment of the Pakistani common mans problems? Bhutto was a man who was a nationalist; none of the policies today are those of nationalism. He was also a man who was a socialist and one does not see any socialism in Pakistan. Zulfiqar Ali Bhutto was not an Islamic Warrior on Jihad, yet even today everyone in the Pakistan Peoples Party continues to call him a Shaheed. For that matter neither was Benazir on any holy war, it then makes you would wonder why she is known as a Shaheed. The moral fiber of the Pakistan Peoples Party is suspect to everyone who has no political affiliations. A vogue if you may, calling every dead political person as a Shaheed, with no respect for the very religion on which the principals of Pakistan are based. In the digital age, media representation is at its highest within the ruling elite, irrespective of your knowledge or purpose. Unfortunately for the Pakistani public, these representatives and I may add women more so than men tend to think loudness stands for correctness. Federal or provincial, ministers lose no opportunity to show their faces on various talk shows at regular intervals, sometimes at two or even three channels in one night. Ministers such as Shazia Marri a provincial minister is nothing short of ear deafening. One would fail to understand her work for the portfolio she is supposed to be handling. The tourism industry in Sindh is anything but flourishing, one feels if it’s not worth it at present then it should be cut down and closed up. A recent event in Sindh for body building took place. A pleasant event to say the least, but with horror one witnessed billboards in Karachi with pictures of the President and Ministers of the PPP on it. Will they ever get enough self promotion at the people’s expense? All around the world social sporting events take place, however you will never witness pictures of politicians pasted on billboards. If Sindh was promoting this event it would have been in line to show some heritage site of the province or some landmark to create awareness. Such is the limitation of thought in ministers, and then they sit on television and talk dramatic history. We often hear of the President talk of “Bibi”, his wife, in almost all his speeches. With utmost respect, I would like to remind him, she is not going to make living conditions better for the common man in Pakistan. Stop talking about her. Get a move on and if you cannot, move out. No Bhutto is going to change the destiny of Pakistan now. Bhutto is a story so old, selling it now is only making people hate the name ever so much more. The really important question then being, is that what they really want? The Pakistan Peoples Party has come to power 2 times prior to their current term. The judicial murder of Zulfiqar Ali Bhutto was never brought up in those two terms, EVER. Why is it that the daughter did not touch the topic in her terms in the past, but somehow the son in law, that too after 3 years of his term decides to pass an ordinance? How about passing ordinances for providing Roti, Kapra and Makaan? Murtaza Bhutto the son of Zulfiqar, and brother of Benazir was also murdered by the police in a PPP term why is that not being brought up? Is he the Next Bhutto? As you already know that Fauzia wahab (Secretary Information Pakistan People’s Party (PPP) is fool and character less woman . Her present stattement has created ambiguity about american terrorist Raymond Davis. 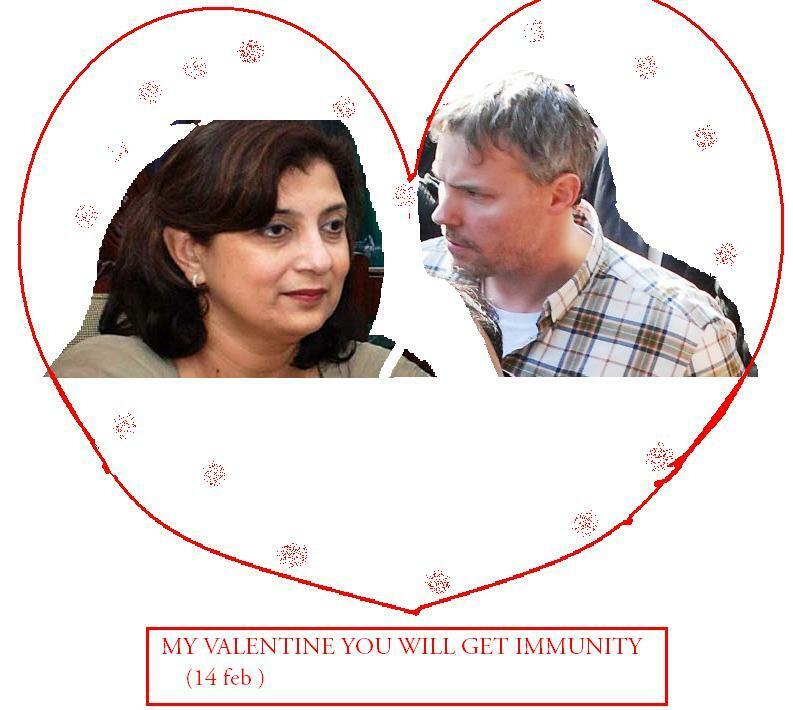 She said that Raymond Davis, accused of killing two Pakistanis in Lahore, enjoyed diplomatic immunity, Geo News reported on Monday. Addressing a press conference at Karachi Press Club, Fauzia Wahab said that Pakistan is the signatory of Vienna Convention, therefore, all the diplomats enjoy immunity, adding that diplomats cannot be arrested under this convention.She said that Davis possess diplomatic passport, therefore, he enjoys immunity. Fauzia Wahab further said that United States is the biggest market of Pakistani products. A large number of Pakistanis are living there, she said and added that 80 percent remittance of Pakistan came from the US. First of all american terrorist Raymond is not diplomat or any technical member.Fauzia wahab statement is contradictory to Salman Bashir(Foreign Secretary at the Ministry of Foreign Affairs) clearly stated that Raymond is not a diplomat and his identity is not disclosed yet. Suppose american terrorist Raymond kills Bilawal or Ali Wahab son of Fauzia Wahab will he get immunity ?? ?What she means by stating ” 80 percent remittance of Pakistan came from the US.” that for money we should not care of our sovereignty. PPP is suciding by these foolish acts and jeopardizing Pakistan.